Rhythm and motion principles are incredibly valuable in creating an electrifying garden! The feeling of movement in your garden will turn it into an oasis. 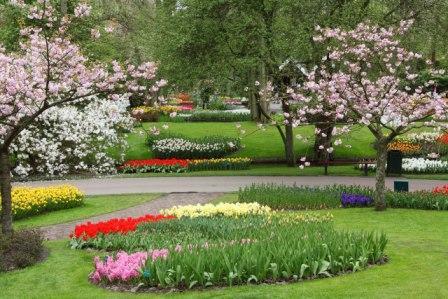 Your garden will automatically stand out among those in your neighborhood if you master this principle well. No boring gardens at your house! If you missed the basics of rhythm and motion you can find those on the Rhythm and Motion Page. One of the dynamic rhythm and motion principles that has tremendous power is alternating rhythm. Alternating Rhythms can be created in a number of different ways. One way that they can be created is by introducing alternating elements as seen in the photo above. 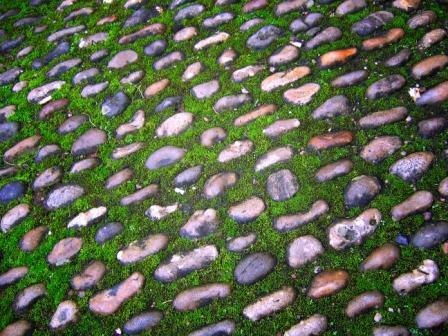 The cobbles here are laid in a rhythmic pattern, and moss is allowed to grow between the stones, thus creating an alternating pattern of earth and green tones. This creates a real sense of interest all by itself. Alternating Rhythms can also be created by using the same element, say a square, and placing it in a slightly different way, either through spacing or orientation as seen in this flight of stairs. This set of stairs uses another alternating rhythm technique in its design. Alternating rhythms can be created by introducing interruptions to a repeating pattern. the sides of the flight of stairs. The effect is much more dramatic than if the same set of stairs were treated with a single set of railings from top to bottom. The use of alternating rhythm in your garden can allow a wide range of effects. However, use some care, as alternating rhythms can easily create a sense of disorder if used indiscriminately. In this photo of Kuekenhof Gardens of Holland, we see another rhythm and motion principle called progressive rhythm. This garden uses repeated shapes and repeated colors to create rhythm and motion. The rhythm progressively changes from this viewpoint. In the forefront, we see a bed of tulips, with elements of red, yellow and pink. Two trees of a very closely related pink are flowering. Behind and to the left, we see a bright yellow color, which is repeated throughout the garden, from the forefront into the distant rear of the garden view. We see also the strong red colors repeated throughout. The shapes of the gardens are also repeated quite closely. However, as the view lengthens into the distance two things become apparent. First, each garden bed, while very similar in shape, is different. They are not identical. Secondly, as you progress toward the rear of the garden view, you see that the garden beds are larger toward the back. Each garden bed progressively enlarges the shape of the garden. A real sense of rhythm and motion is created through this treatment. In spite of the many colorful elements along the way, your eye is drawn to the distance by both the progression of shape and size, and by the repeated color scheme. 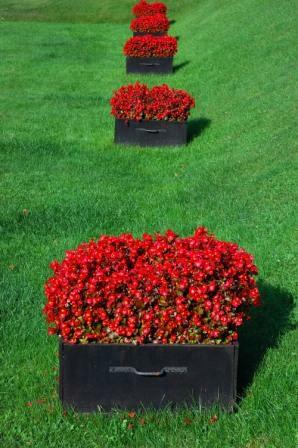 These containers are all placed just at the bottom of a slope in a perfectly aligned line of red bursts of color. The containers are brought into dramatic relationship with one another by the placement as well as the color. Our eyes automatically process these as related objects which form an overall design due to their placement. Another useful rhythm and motion principle of design is proximity. Placing different or related items near to one another can create a relationship between them. In the lovely residential garden above, there is a real sense of rhythm and motion created. However, note that the various furnishings and plants that make up this garden are somewhat unrelated. 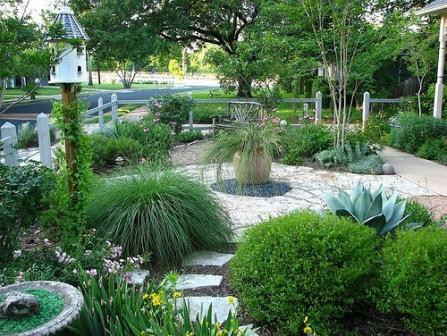 It is made up of a bird bath, a garden pot, a bird house, some white stone paving, and a variety of plants. So why does the garden appear integrated? Why does the sense of rhythm and motion still seem present? The answer is that while the objects are somewhat unrelated, the principle of proximity is at work. Proximity refers to the nearness of an object to another object. Note the following about the garden above. The birdhouse, the garden pot and the birch tree are in a direct line with one another and close enough to each other to create a visual line. The garden pot is equidistant from the birch tree and the birdhouse, which brings a balance to the design. Both the bird house and birch are taller elements in the garden, and therefore create their own relationship to one another. The mounding grass, the garden pot (also with mounding grass) and the specimen grey colored agave plant form a perfect triangle, which also creates a strong relationship based upon the proximity, or nearness, of the objects. The grey color of the agave leaves causes it to stand out from the rest of the grouping of plants, which allows it to serve this function. The white stepping stones, the white paver stones in the middle of the garden, and the cement walkway near the house create a strong, zig zag line through the garden, thus creating a unity by drawing the garden elements together. Again, proximity is at work! All of these unrelated elements take on a relationship because of the thoughtful placement of plants and furnishings in a way that creates a design relationship between them. Another demonstration of the power of the rhythm and motion principles to enliven garden design! Use these principles of design! 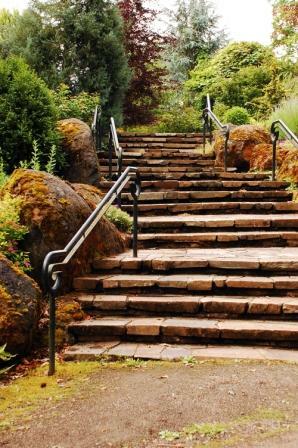 They have tremendous power to step your garden design up and create an elegance and majesty in your garden that is not often seen in residential landscapes. Use this secret to invest wisely in your garden and make the most of your garden design funds!